FAQ: How old should or can a source be for my research? How old your research sources can be, using the publication date or date of creation as the defining criteria, is either stated in your assignment rubric or depends on your field of study or academic discipline. 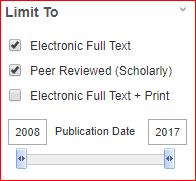 If it’s a requirement for your assignment, look for words like “sources must be published in the last 10 years” or words to that effect that specify the publication date or range required. If the currency of sources is not a requirement of your assignment, think about the course involved and what an appropriate age might be. How fast-changing is the field of study? Sources for a history paper might, by their very nature, be older if they are diaries, personal letters, or other documents created long ago and used as primary sources. Sources used for research in the sciences (health care, nursing, engineering), business and finance, and education and other social science fields require more “cutting edge” research, as these fields change quickly with the acquisition of new knowledge and the need to share it rapidly with practitioners in those fields. A good rule of thumb is to use sources published in the past 10 years for research in the arts, humanities, literature, history, etc. For faster-paced fields, sources published in the past 2-3 years is a good benchmark since these sources are more current and reflect the newest discoveries, theories, processes, or best practices. For further assistance with this or other search techniques, contact the Shapiro Library at 603.645.9690, by email at ask@snhu.libanswers.com, or use our 24/7 chat service.